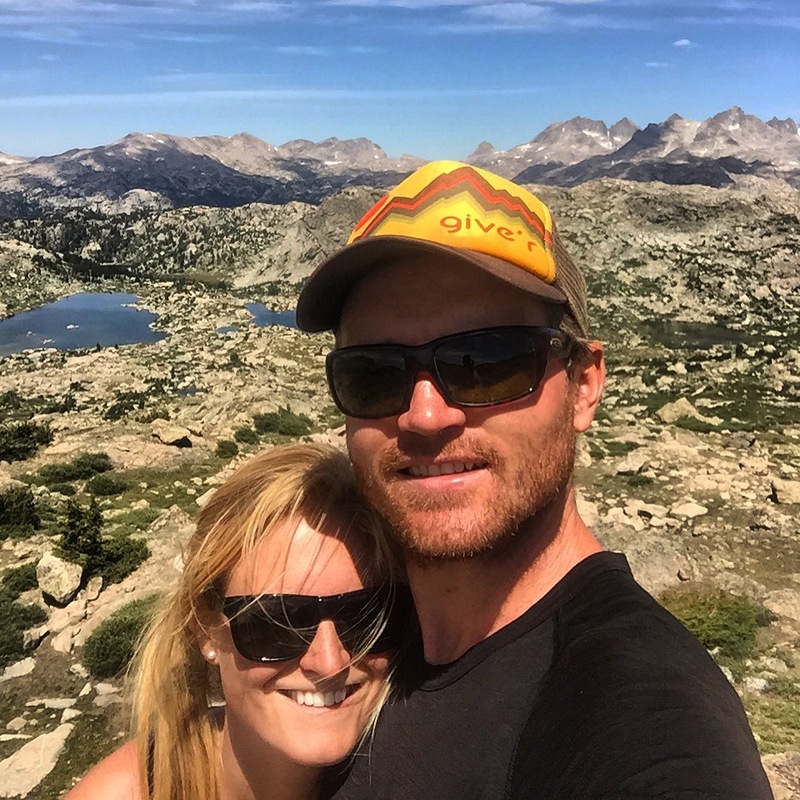 Editor's Note: Rene Etter-Garrette is a 32-year-old skier who lives in Jackson Hole, Wyoming, and writes for an adventure blog called Outdoor Beta. On February 4, two weeks after one of his closest friends was killed in an avalanche in Montana, he was caught in a slide in Grand Teton National Park. 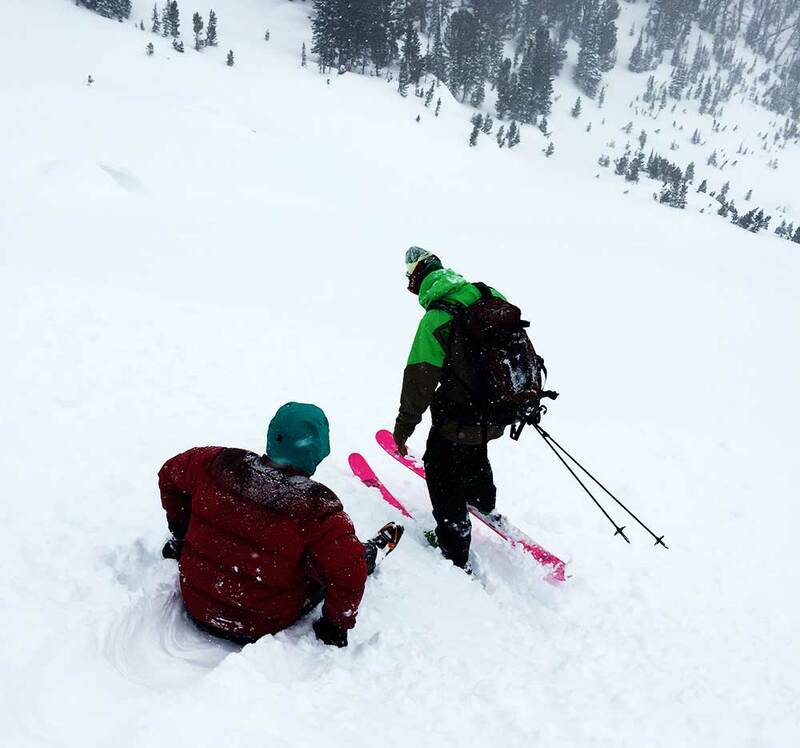 The slide broke his tibia in 22 places, and thanks to the rapid response by his ski partners, Jenny Lake Rangers, and the Teton County Search and Rescue, he made it out alive. Below is his story. He's sharing it because he hopes it will help educate others. "Transparency helps everyone learn from others experiences," he says. "I want to be able to share it, whether people pick up a few lessons if it were to happen to them or be prepared for an accident." To that end, we have isolated a few lessons he learned along the way. At a time when people are quick to judge another person's actions in the backcountry, we ask that you first consider his story and try to apply the lessons to your own practice. Rene Etter-Garrette and his girlfriend, Zelie Morrison. All photos courtesy of Rene Etter-Garrette. THE SKY WAS DARK and the air crisp on the morning of February 4 as we skinned toward the Spoon Couloir in Grand Teton National Park. Moving along in meditative unison, my mind began to wander to the events of the past two weeks. A lifelong friend, Darren Johnson, had died in an avalanche while patrolling at the Yellowstone Club on January 19. This massive loss had ripped a hole in my soul and I was heading into the mountains to repair the damage. I never guessed that I would nearly suffer the same fate as my friend. Darren was a huge force in my life and the major reason I was skiing in the Tetons. He moved west from New Hampshire out of high school, eventually finding himself in the Forestry Program at the University of Montana. Years later, he became a ski patroller at the Yellowstone Club, a job he loved. Darren would make numerous trips down to Jackson each winter and we would ski around the Tetons. 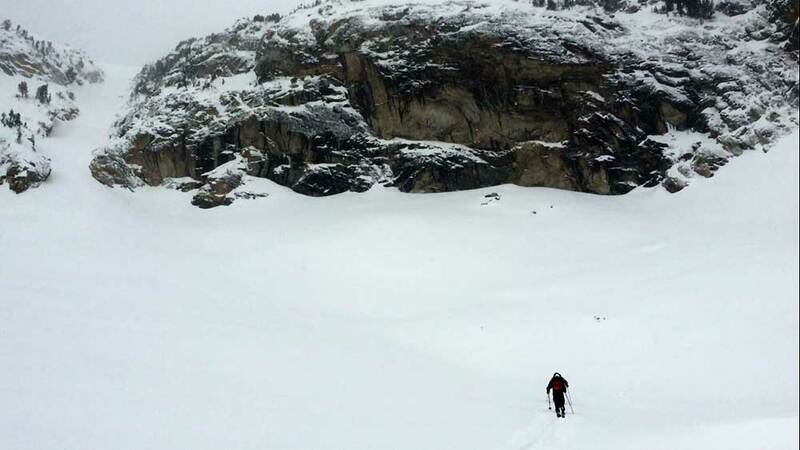 His last trip down to Jackson, we skied the Apocalypse Couloir in powder. He couldn’t have been happier. 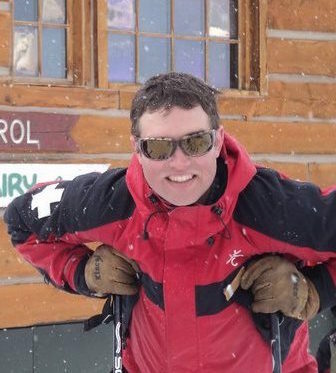 Darren Johnson, a ski patroller at the Yellowstone Club, was killed in an avalanche on January 19. Darren's fatal accident happened just outside the Yellowstone Club boundary, while ski patrolling. After hearing the news, my brother and I drove to Big Sky to be with friends and family. The sudden loss of Darren was immense and cut directly to my core. He was a larger-than-life figure and in a split second, he had been taken. As a backcountry skier, you constantly hear of people dying in avalanches, but you never imagine it would be someone you're close to. Darren’s death threw my relationship with the mountains upside down and I questioned if the risks of backcountry skiing were worth the rewards. I struggled with the reality that I could die in an avalanche and could no longer lie to myself about the consequences of a misstep. I had seen the devastation firsthand and never wanted my loved ones to go through that pain on my behalf. After much contemplation, I decided to venture back out. I find peace and inner energy in these sacred places and truly believed Darren would want me to continue backcountry skiing. With this decision made, I started thinking about objectives. I wanted to ski something I had skied before that didn’t have any terrain traps (Darren died from blunt force trauma to the chest). I eventually settled on the Spoon Couloir off Disappointment Peak, in the heart of the Tetons. I had skied it four times and felt it met the criteria for a safe game plan. My friends Mike Bessette and Brian Close agreed to join me. Brian had to work at 3 p.m. that day, so we decided on an early start. The fact that Brian had to get back early didn't affect our routine or judgment. If anything, it helped by giving us time to perform the helicopter extraction. Normally, I plan an hour or so of "random" time for a trip…this can be a slower partner, or equipment failure. In this case, it was valuable time for a rescue. We left town around 6 a.m. and chatted about the avalanche forecast, which for that day was "Moderate." 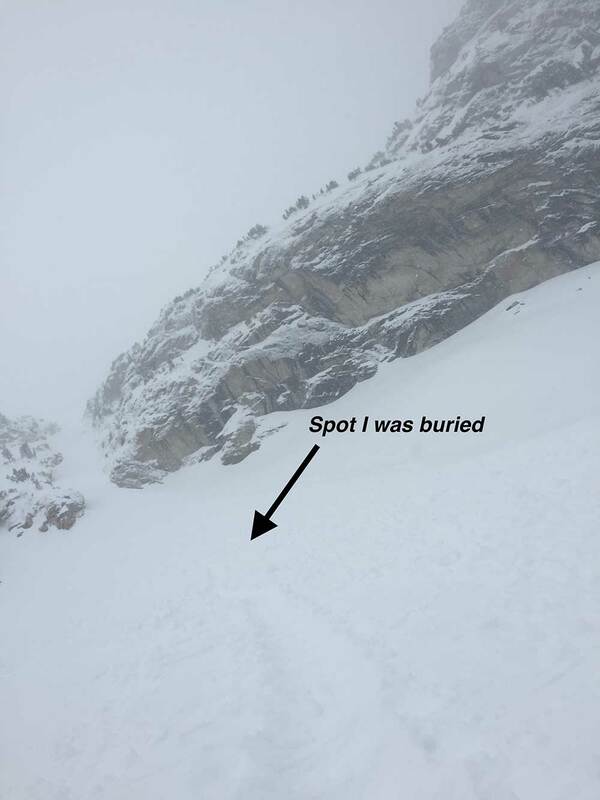 The Bridger Teton National Forest Avalanche Center noted: "Soft slabs with depths of two feet could be triggered…by skiers in steep avalanche terrain. These slabs are most sensitive at higher elevations where strong northeast, northwest, and west winds have loaded snow on leeward terrain features." We expected to find a few shallow soft pockets of instability, but nothing too serious. We were moving at 6:45 a.m. and made quick time up a day-old skin track. After three hours, we were at Amphitheater Lake staring up at the Spoon Couloir. The Spoon had flushed recently, with debris making up the majority of the apron. We made our way to the right side of the entrance, in a safe zone, to gear up for the bootpack. We stashed our skins and extra gear in a mini snow cave here. (Editor's Note: It is common practice in the Tetons and elsewhere for skiers to stash gear, like skins, at the bottom of a run they know for certain they will be descending). At 11 a.m., we were moving up the couloir through mostly soft, thigh-deep snow. There was a sporadic 1-inch finger hard crust at times, but nothing of concern. We noticed pockets of wind-blown snow on the left side of the couloir and made note of that for the descent. On the right side, it was deep fist hardness (soft/fluffy) snow. The climb was slow and difficult, but we took turns leading the charge and eventually we were near the top of the couloir. The Spoon terminates in a steep concave bowl, the one area I was concerned we could find a wind pocket. I mentioned to Brian, “If this goes, at least there is a huge run-out below." We worked our way up the far right side of the bowl, hugging the rock wall and digging two quick hand pits. With no red flags, we worked our way up to the right, eventually benching out on a rocky ledge. Based on everything we were seeing, I don't believe we misjudged or ignored the forecast. The wind had deposited snow on the left side of the couloir. Also, after digging two hand pits on the right side of the bowl, we didn't see any areas of concern. While the avalanche report is one tool, it is a starting point, and I would trust my field observations more than the report. In hindsight, I could say, based on the report, that there was a chance we could find a wind slab on the right side of the bowl, but we didn't see that and were most concerned with the left side of the bowl. We then continued up the East Face of Disappointment Peak. The snow was consolidated here and we topped out at an elevation of 11,125 feet at 12:30 p.m.
We took some time to fuel up, and then got ready to ski. After clicking into my Dynafit bindings, I pulled the binding toe-lock up one notch. I typically lock them up completely for a line like the Spoon (making it nearly impossible for them to release), but for some reason, I decided not to. Also, when I was about to throw my pack on, I took off my mittens and put on my gloves. After gearing up, we traversed skiers right on the East Face, then skied down to the entrance of the Spoon. We performed a ski cut from the skier's right side of the couloir down to the left across the upper bowl. 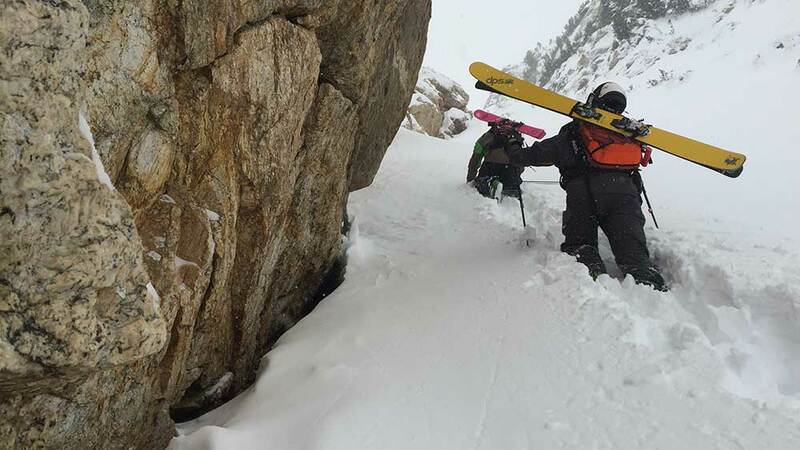 There were some wind deposits on skier's right side of the couloir, so we thought there would be a chance the rollover would hold a few small wind slabs. We also talked about where I was going to cut to and decided the safest point was to aim above an exposed rock. I looked up to my left and saw a mini avalanche coming toward me. I had a moment to see the fracture and guessed it was about 12 inches deep and most likely a dense wind slab. I braced myself for the impact of the small slide, leaning into the 45-degree slope and hoping that it would pass over me. For a moment, it seemed like I would escape with just a scare. But a large piece of debris hit my upper boot and knocked me off my feet. In one instant, I was in an avalanche at the beginning of a 1,400-foot-long couloir that pinches to about 20 feet at its narrowest point. For a few seconds, I was above the avalanche and could see the entire couloir below me. Then, I was violently pulled under the snow. My skis were acting like anchors and I could feel myself going deeper into the avalanche, which had turned into a full-blown slide. Around this time, I felt my bindings release. When to lock out your tech bindings is a topic of discussion among backcountry skiers. Dynafit and other binding manufacturers say NOT to lock out your toes. But for myself and others, if you are skiing an icy couloir that ends in a cliff, one might think about locking the binding out. Conversely, if you were skiing mellow powder fields, you probably wouldn't lock out your toe. Whatever side you are on, I can assure you that if you ever find yourself in an avalanche, you are going to hope your bindings are not locked out. With my skis off, I began to take check of my body position in the slide. I was fairly certain that I was positioned with my feet facing downhill and my head up. Then I noticed my mouth was completely filled with snow. I spit it out instinctually, only to breathe in more snow with the last air in my lungs. I resolved to stay calm and continue fighting toward the top. I tried to swim upwards, but my poles were pulling my arms down low. If I ever ski in the backcountry again, the first thing I will do is cut off the straps on my poles. BAM! My left foot smashed into a rock. It seemed like my foot had turned completely to the left. The impact spun me and sent me hurtling uncontrollably downhill. I had no clue where up or down was. All I could think about was that I was going to die if my head or chest impacted a rock at this speed. I am not sure how I knew, but I suddenly felt certain that I had made it out onto the apron. I was now solely concerned with fighting to the surface, having miraculously missed all the rocks at the bottom of the Spoon. Then something happened I will never forget. Without warning, all my attention went to my right wrist. Time stood still and the roar of the avalanche subsided. Right at that moment, I felt my pole strap being gently removed from my wrist. Take a moment to think about this: I was in the depths of a violent avalanche being twisted and rolled down a slope at 30 mph. Yet, it felt as if I were lying still in the snow and someone was delicately removing my pole strap from my wrist. The second the strap was off my wrist the “slow motion” ceased and I was back in the maelstrom tumbling down the mountain. I tentatively opened my eyes. I couldn’t see out of my left eye, but could see the world out of my right. I looked down and could see my hand was partially buried, but my fingertips were above the snow. Only the right side of my face and fingertips were above the snow. I tried to stay calm, but was barely able to pull snow from my mouth with my fingertips. If I had been wearing mittens, I don’t think I would have been able to clear my airway. I will always be wearing gloves when skiing in avalanche terrain. Something you don’t think about, but the dexterity of the gloves helped save my life. Mike quickly made his way to me and asked if I was OK. I said my ankle was shattered, but relatively speaking I was in good shape. He asked if I had pain in my spine/neck, which I didn’t. He then started digging me out, being very careful around my left leg. He was working on getting me free when I noticed Brian skiing down. I suddenly remembered the skins and had Mike yell up to Brian to grab them. I knew the skins may be essential to the rescue and am glad we didn’t overlook this small, but critical detail. In a rescue situation, you need all the tools possible and the skins were very important to have. They could have been used to make a sled for a ground rescue or as an alternative to paracord. Meanwhile, the pain in my leg suddenly became excruciating. I asked the guys for pain meds. Brian had some and a bunch of Ibuprofen. I gobbled those down and told Brian to call Teton County Search and Rescue. I knew my skis were missing, my ankle was badly broken and a little storm was blowing in, so a rescue was going to be necessary. As Brian attempted to connect with rescuers via 911, Mike tried to make me comfortable. We were very concerned about hypothermia, considering it was about five degrees out and I was in shock. Mike had a huge down jacket and big mittens, which he gave me. We also took out our emergency blankets to try and retain as much energy as possible. I carry a 32-liter backpack and have a substantial first-aid kit along with emergency supplies (headlamp, batteries, matches, lighter, zip-ties, paracord, rubber ski straps, space blanket, ducktape). Weight is always a factor on big days, but thankfully, we carried essential emergency tools. After a few minutes, the connection cut out between Brian and TCSAR, but we had a rough plan in place. We needed to stabilize my leg and then make our way down to Amphitheater Lake (about 600 feet below), assuming that would the best place for a helicopter to land. Our first priority was to evaluate my leg and get it in a splint. I had felt around my boot top and didn’t feel any bones, nor did I have the sensation I was bleeding. This was great news and meant the break wasn’t compound, but most likely in my boot (which would act like a splint and apply pressure, decreasing swelling). 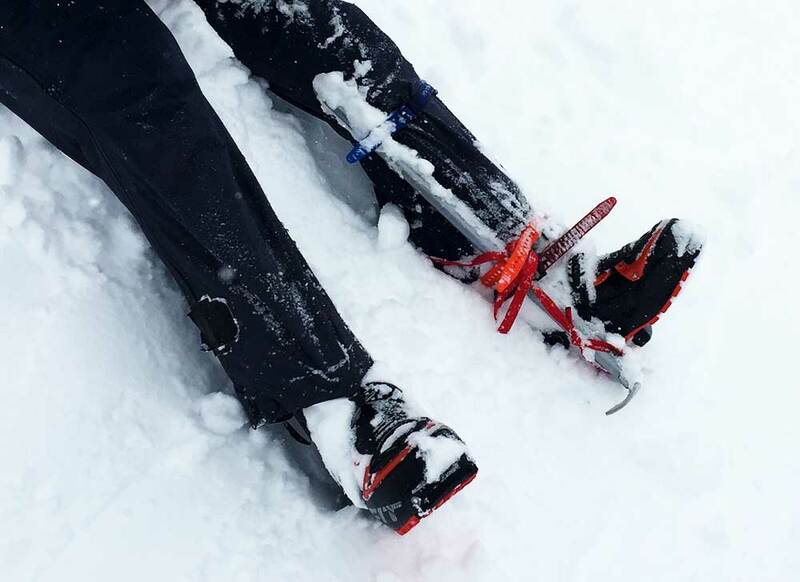 To stabilize the leg, we used three rubber ski straps to fasten an ice axe and shovel handle against my leg. Mike's presence during that time was critical to maintaining my psyche. He reenergized me and more importantly reassured me that everything was going to be OK. When Brian returned from the ridge, he had a dour look on his face. He quickly explained that a helicopter rescue might not be possible due to weather. This was deflating, but we knew we had to get moving regardless of the helicopter. I was getting very cold and moving would be good for me, despite the pain. We gathered our gear and began to make our way down the last slope to the lake, silently thinking to ourselves that this could prove to be a much bigger ordeal. All of a sudden I heard a faint thwup-thwup-thwup. I yelled for the others to stop and it became louder, “THWUP-THWUP-THWUP.” The helicopter had given it a try and was coming closer to us. Apparently, Jim Woodmencey from MountainWeather.com had given a spot forecast to the rescue team moments before. He said they had a 20-minute window to try for the helicopter rescue and that there was no chance after that. We yelled and screamed with excitement, moving faster down to the lake. As the chopper finished its second pass it began to descend on our location. The rotor wash was powerful and I covered my face, thinking to myself, “Please land." A moment later the rotor wash subsided and I looked up to the sight of the helicopter at the edge of the lake. The rangers helped into the bird and tried to relax, but I was shaking uncontrollably with intense pain. The pilot, Nicole Ludwig, powered up the chopper and we flew out to help, family, love, and life. In honor of Darren Johnson and his family, please donate to the Gallatin National Forest Avalanche Center here. As a thanks to the Teton County Search and Rescue, please consider contributing here.